Why is website accessibility important? Why is website performance important? Fully documented accessibility solution for government agencies, federal contractors and non-profit organizations to achieve compliance with Section 508. Aurora develops Section 508 compliant websites for government agencies, federal contractors and non-profit organizations looking to comply with accessibility regulations including: ADA Title II and III. 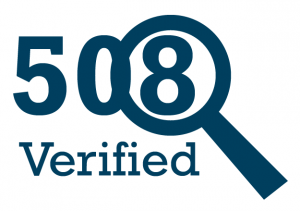 We verify and certify our Section 508 websites for compliance, and stand by our work. What is a Section 508 compliant website? Section 508 compliant websites meet or exceed the W3C’s Web Content Accessibility Guidelines (WCAG 2.0) priority level AA compliance—as required by the US Access board (ICT Refresh). Section 508 compliant websites work seamlessly with assistive technology devices such as screen readers, braille displays, and screen magnifiers to ensure that people with disabilities have full access to services available on the web. Government agencies, federal contractors, and non-profit organizations that receive federal funding are required to comply with Section 508. Organizations that fail to comply with accessibility regulations risk losing federal funding streams and may facing negative publicity. All Section 508 Compliant websites come with a full accessibility conformance evaluation and certification to ensure that your site is accessible for persons with disabilities. At Aurora, we use both automated (i.e. Wave) and manual tools (i.e. NVDA Screen Reader) to get a complete picture of the accessibility of your website, and to document and remediate any accessibility errors. Take the worry out of compliance, and get a fully accessible Section 508 compliant website for your organization.